Fall Sale on Decorative Concrete Coatings! Through the end of November, Amazon Coatings, LLC is offering Special Pricing on ALL New Concrete Coating Applications! Get the details here now! Don’t forget to check out our job photos in our portfolio! Contact us for your Free Estimate at 480-890-1141 or use our Contact Page below for additional information. Amazon Coatings ~ Local, Family-Owned and Operated Since 2001. Proudly serving Phoenix South East Valley cities of Mesa, Chandler, Gilbert, Gold Canyon, Apache Junction, Queen Creek, Fountain Hills, San Tan Valley, Scottsdale and Phoenix. Look at that garage floor coating…..it’s like a mirror! So clean, so neat, but more importantly, it’s functional! What is the main purpose of my garage? Garages are designed as a place to park our vehicles! That sounds all well and good, but our garages serve many other purposes, such as storage areas, play areas for the kids, work shop area for crafts, wood working and vehicle repairs. For some, the garage becomes an extended area of the home….a place for parties or even a home office. 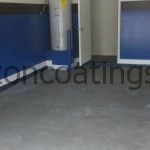 What do I want to accomplish by applying a garage floor epoxy coating? Do want a floor that can be easily cleaned? Do you want a floor that does not stain if your vehicle leaks oil or other fluids? Do you want to cover stains that are already there? Is your concrete damaged or pitted and you want to improve the overall look? Do you want your garage to look clean and organized? What are the benefits of a coated garage floor? Garage Epoxy Floors are sealed! Fluids do not penetrate; oil from that leaky car are wiped up with a paper towel. By selecting an epoxy coating in one of our standard colors, existing floor stains are covered. By applying an epoxy coating to your floor, the pores of the concrete are sealed; they will no longer hold dirt and dust…your floor looks cleaner and IS cleaner. We can repair damaged concrete, either by patching small areas or providing an upgraded epoxy system suited for your specific needs. 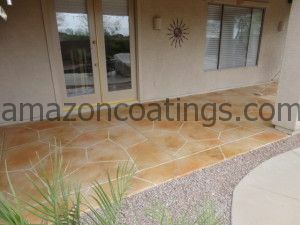 Amazon Coatings has proudly serviced the Phoenix South East Valley for over 15 Years!! Cities include: Mesa, Chandler, Gilbert, Apache Junction, Gold Canyon, Queen Creek, San Tan Valley, Tempe and some parts of Scottsdale. Let us help you with your garage floor coating project. 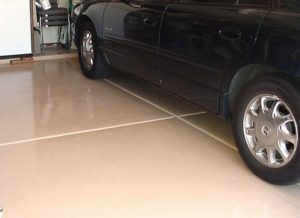 Our Performance Coatings for garage floors and driveways are top of the line! The Epoxy and Polyurethane Performance Coating (shown here) is a two coat system with a high-solids polyurethane sealer that provides heat resistance, chemical resistance and an easily cleaned surface. You have our guarantee that we use only the highest quality, commercial-grade products that will provide years of protection. Our garage floors, typically, will never have to to be re-sealed!! Not only does a garage floor coating look good, it helps to cut down on the dirt that is tracked into your home. Sealing your concrete closes the pores of the concrete so they can no longer hold dirt. Oil and other liquids are wiped up with a paper towel. To help minimize slips and falls, a fine-graded silica sand is added to the surface. This project was just completed and our homeowners could not be happier! 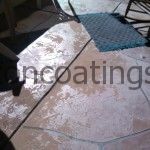 Concrete Coatings for Patio, Pool, Garage and more! Update the look of your patio and other outdoor living spaces with a decorative concrete coating from Amazon Coatings, LLC. Our concrete coatings are durable, easily cleaned and improve the overall look of your home. Only top quality products are used providing tough, long lasting surfaces. Textured coatings provide slip resistance, especially around the swimming pool. Garage floors… Moving into a new home and want a clean, sleek look? We work with your schedule; it’s always easier to have your floor coated prior to moving in. One more item checked off your to do list! Application time is 2-3 days; foot traffic allowed 24 hours after completion and vehicle traffic allowed 7 days later. Too long for you? We can apply our upgraded, quick dry system and have you back in your garage in 3-4 days! Already living in your home? Tired of tracking in dirt from that message garage floor? We can help with that too! The same system as above AND you’ll get the chance to clean out your garage. Oil and grease stained concrete? Easily handled during our thorough cleaning process. Our commercial grade Polyurethane Sealer is heat resistant, scratch resistant and provides top of the line chemical resistance. Easily clean your beautiful new floor with a mild cleaner as needed. you’ll be amazed at the change. Existing coating faded or chipping, let us take a look. In many cases, if the coating is securely bonded to the concrete, we can make the necessary repairs, add some color and re-new your deck at a fraction of the cost to remove and replace. What are you waiting for? Contact us today for your free estimate… 480-890-1141! Proudly serving Mesa, Chandler, Gilbert and other Phoenix East Valley cities since 2001! These goblins LOVE the flagstone coating on this patio! You don’t need to be afraid of having an ugly patio. 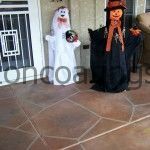 Our decorative flagstone overlay coatings come in a variety of colors and textures. Small patio or large, we design a flagstone look that will fit your area perfectly! Not a fan of flagstone, how about a tile or slate layout; maybe acid stain or epoxy & poly. 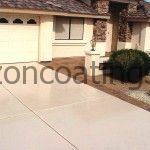 We also provide coatings for your Garage, Driveway, Entry, Sidewalk and Swimming Pool Deck. 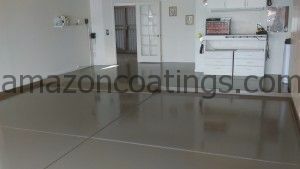 Check out our floor coating gallery at www.amazoncoatings.com. Give us a call with any questions you may have or to get a free estimate. – How old is the coating? – When did the coating start to peel? – Was the surface recently “re-sealed”? – If it was re-sealed, how was the surface prepared? – Is there evidence of excessive moisture near the area? – What type of concrete coating is present? Many times, the floor coating is past it’s “due date” to be re-sealed. 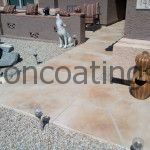 Wear & tear and our hot Arizona Sun can take its toll on our concrete coatings. Floors should be cleaned and re-sealed about every 3-5 years, depending on the type of sealer originally used and the type of coating installed. Amazon Coatings, LLC uses only the finest commercial grade coating products! 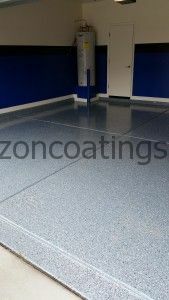 We learned early on, that it is better to use high quality products and charge just a bit more than it is to use inferior coating products which produce inferior floor coatings. The money saved on a cheap coating is lost when repairs and frequent re-coats are required. Have a problem with your coating? Is your existing coating 3-5 years old and ready to be re-sealed? Don’t have a concrete coating, but thinking about having one installed? What are you waiting for? Contact us, Amazon Coatings, LLC at 480-890-1141 for your free in-home estimate. 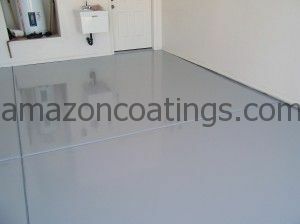 Our website is www.amazoncoatings.com. Amazon Coatings, LLC is a local, family-owned and operated Concrete Coatings Contractor. We are licensed with the State of Arizona and an A+ BBB Member. We’ve proudly served the Phoenix East Valley since 2001. Give us a call Today! 1) Oil drips: They wipe up with a paper towel! No floor coating is indestructible, but, by using the right materials, they can be pretty forgiving. 2) Cleaner Garage: Your garage will stay cleaner because dirt and dust are not trapped in the surface pores of the concrete floor. A sealed garage floor will be much easier to clean. In the absence of wet spills, you can sweep or use a leaf blower to clean the floor. 3) Cleaner garage means a cleaner house: Less dust and dirt are tracked into the house when the floors are clean in the garage. Enough said…. 4) Brighter Garage: Epoxy floor coatings will provide “reflective” light, making the garage appear brighter. The lighter the color the brighter the garage will look. In the absence of good lighting, this is definitely a plus. 5) It looks good! These days we do more than “just park our cars”. Garages act as playrooms for our kids, party rooms and Man Caves! Floor coatings are not just for garage floors, they are an easy way to “dress up” your patio, driveway, entry and sidewalks. There are a wide variety of coatings available beside the “painted” coatings. Many textures and shapes can be made using a polymer modified cement overlay system. Choices vary from stone, slate and tile to surfaces with texture like found around swimming pools. Why have a boring concrete floor when there are so many coating options available. 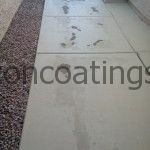 Check out our website at www.amazoncoatings.com then give us a call for your free in home estimate: 480-890-1141. First and foremost, concrete coatings, whether epoxy, polyurethane, polymer modified overlay or stain, DO NOT REPEL DIRT! Sealers and coatings are designed to allow you to clean your floor easier than the bare concrete surface. Concrete is porous, thus it holds the dirt and dust; making hard to clean. By applying a sealed concrete coating, the surface is no longer porous so the dust and dirt are not trapped in the surface. So again, how do you clean your concrete coating? Always sweep your floor to keep dirt and dust from building up and being ground into the surface. If the floor is outdoors, you can easily use a leaf blower or garden hose. If indoors, you can always use a broom or dust mop. The surface is easily cleaned with water; by mop or hose. A non-filming cleaner can be used if water alone is not giving the desired results. I like to use vinegar and water as my “go to” cleaner. These measures will help to extend the life of your concrete coating and keep it looking good! 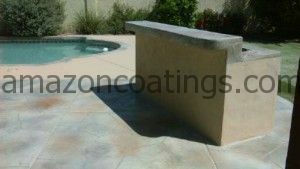 Feel to contact Amazon Coatings, LLC at 480-890-1141 if you need help cleaning or re-sealing your epoxy concrete coating. We have serviced the Phoenix East Valley for 14+ years…and counting!! 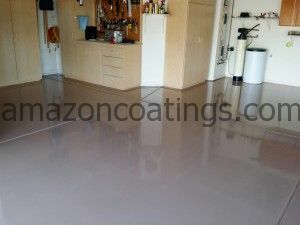 Check out our website at www.amazoncoatings.com. The success of your concrete floor coating, like all things, starts with proper preparation of the surface. Even the most expensive coating materials will fail if the surface is not prepared correctly. You must “open the surface pores” of the concrete so that the coating materials can form a tight bond with the surface. The surface must be free of dirt and contaminants as well. While there are various ways to achieve this, many professional concrete coatings applicators and DIYers will use a Chemical Etching Method. Chemical Etching is an effective preparation technique used on concrete that is “bare” or “un-coated”. The application of an acid based mixture on the concrete will cause “fizzing & bubbling” of the surface. Despite how this looks, this is a good thing! If there is no “reaction” when applying the mixture, this means that the concrete has some type of sealer present that the etching solution can not penetrate. Other means will be necessary to correctly prepare the surface. After you have “etched” the surface, it must now be “neutralized”. This can be completed by applying a mild ammonia and water solution. Some individuals use baking soda to neutralize the acid mixture. In both cases, the idea is to stop the action of the acid. Finally, the surface must be rinsed thoroughly! No traces of the etching or neutralizing solution can remain. It is best to rinse the surface a couple of times to make sure all traces of dirt and contaminants are removed. If in doubt, rinse again! Your concrete floor preparation is now complete! What type of coating do you want to apply? Epoxy, Polyurethane or maybe a Flagstone Coating? 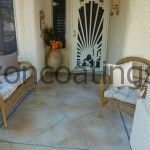 Amazon Coatings, LLC is a Professional, Licensed Concrete Coatings Company. 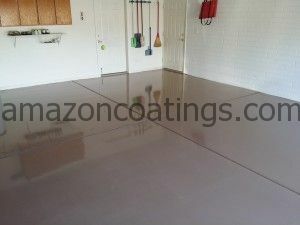 You can visit our website at www.amazoncoatings.com. You may reach us at 480-890-1141.